Brightness is a tool to control your screen brightness. If you are using a laptop turning down your screen brightness can increase battery life by a large amount as well however too dim and the screen will be illegible. To use brightness click on the dial towards the right window of the window. To make the screen dimmer use the left arrow key or click on the dial and drag it towards the left. If you want to make the screen more bright press the right arrow key or drag the dial towards the right. After doing this you will be asked to confirm the current brightness is OK while needing to select Yes. If you do not respond it will go back to the old brightness which is useful because if you made your screen illegible it will revert to the old settings. If you do not want to confirmation uncheck the Require Confirmation after settings change. 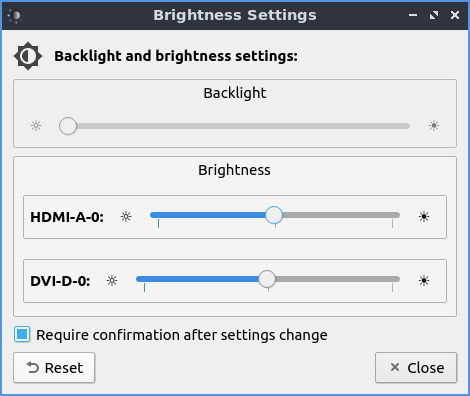 Lubuntu ships with 0.14.1 of Brightness.